Customizable Embedded Processors, Volume . "This book represents a significant contribution to understanding and using configurable embedded processors. The reader will find all design aspects described in detail by the experts in the field, and thus this book will serve as the "standard reference" on this topic. This contribution is very up to date and complete, as it covers modeling, analysis and design of both the hardware and software components of customizable processors. A unique feature is the gathering, under the same cover, several topics that are different in nature but intimately related." --Giovanni De Micheli, Professor and Director of the Integrated Systems Centre at Ecole Polytechnique Fédérale de Lausanne (EPFL), Lausanne, Switzerland, and President of the Scientific Committee of CSEM (Centre Suisse d'Electronique et de Microtechnique SA), Neuchâtel, Switzerland. "The concept of configurable processors has emerged from the lab and entered the mainstream for high-volume electronic systems. Customizable Embedded Processors is the best overview to date of this rapidly evolving field. It pulls together the work of the leading researchers and practitioners from around the world into a single consistent exploration of the benefits, challenges and techniques for creating efficient application-specific processors. It explores both the widely proven benefits and the theoretical limits to customization. 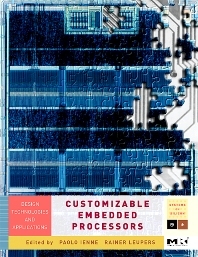 Configurable processors have become an essential building block for modern system-on-chip design, and this book is an essential tool for understanding the leading-edge of configurable processor research.." --Chris Rowen, CEO, Tensilica, Inc.
"It is clear that application-specific instruction-set processors (ASIPs) will be a key building block of the emerging multi-processor system-on-chip platforms of the next decade. For many critical functions, the competing requirements of flexibility and efficiency will favor their use over general-purpose processors or hardwired logic. As a longtime advocate for ASIPs, I am delighted to discover this book which covers the key aspects of their design and use from a variety of perspectives: from leading edge industry R&D labs, through startups, to academic research leaders. It covers the technical challenges in ASIP use, but also many of the important non-technical issues. Most of the leading innovative ASIP projects are covered here, so this book may well become the definitive reference for this increasingly important domain." --Pierre Paulin, Director, SoC Platform Automation, STMicroelectronics Inc.
"Standard Processors have been the fuel for the computer revolution over the last 50 years. A new technology called Custom Embedded Processors is fast becoming the key enabling technology of the next 50 years. In this book the reader will learn the basic theory, and practical examples of how this powerful new approach has been put to use. It’s a must read far anyone hoping to build the next big thing in the 21st century." --Alan Naumann, President and CEO, CoWare, Inc. Professor of Software Systems on Silicon, RWTH Aachen University, Germany.